Because "Two worlds collided, and they can never, ever tear us apart." What happened to change everything was that a soft little nudge bumped my hand - from inside my body. ...I was having a moment. Possibly the biggest of my life. From that first little touch, the whole world had shifted. Where before there was just one thing I could not live without, now there were two. There was no division - my love was not split between them now; it wasn't like that. It was more like my heart had grown, swollen up to twice its size in that moment. All that extra space, already filled. This child, Edward's child, was a whole different story. I wanted him like I wanted air to breathe. Not a choice - a necessity. ~Because they will be a family forever. ~Because nothing can tear them apart. ~Because they are the epitome of family. ~Because the love in this family runs deeper than anything else. ~Because they are our favorite family. ~Beause in Bella and Renesmee, Edward gets every single thing he wants, plus the things he didn't think to ask for. ~Because Renesmee lets mommy know daddy is in on it. ~Because Edward singing to her was so perfect, Renesmee showed it to Bella twice. 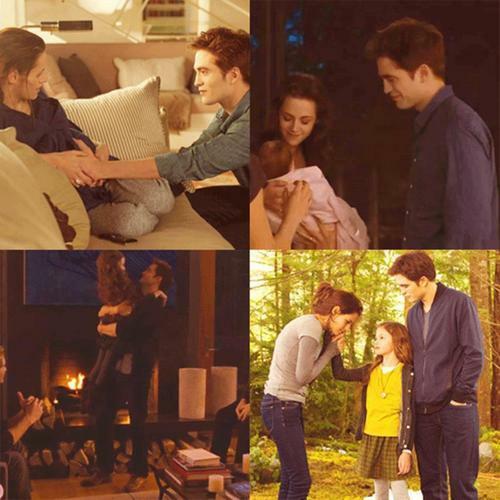 ~Because Renesmee waited almost three days to be in Bella's arms again. ~Because Edward marvelled with Bella over her belly. 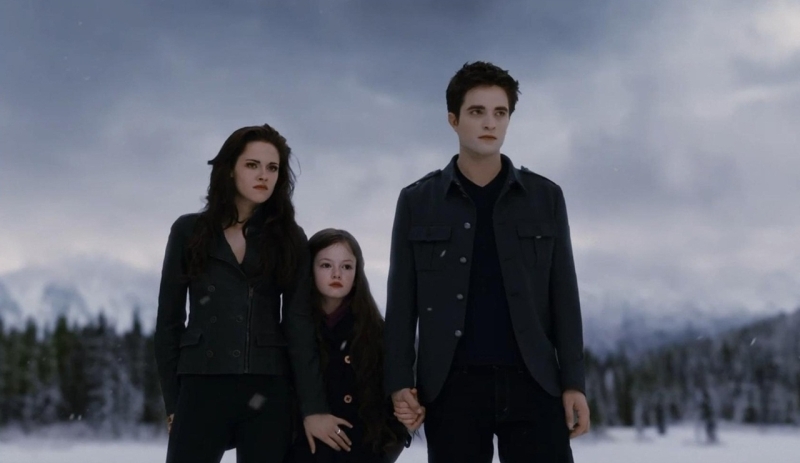 ~Because Renesmee loved them even before she was born. 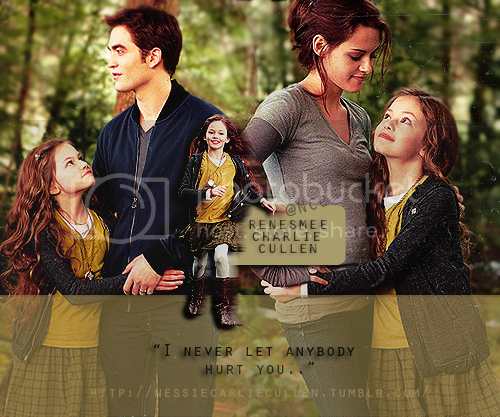 Renesmee was real and I knew her. She was the same one I'd fought for from the beginning. My little nudger, the one who loved me from the inside, too. Half Edward, perfect and lovely. And half me - which, surprisingly, made her better rather than detracting. I'd been right all along. She was worth the fight. just to hear me talk in my sleep. I could watch Renesmee dream forever. It was only a little while later that Edward reminded me of my priorities. It took him just one word. I was euphoric the vast majority of the time. The nights did not have enough hours to satisfy my need for Edward. Edward hugged Renesmee just a little bit tighter to his chest. He smiled my favorite smile. "Hurry back to me." "I love you," I told her. "More than anything." "I love you, too, Momma," she answered. She touched the locket at her neck, which now held a tiny photo of her, Edward and me. "In our hearts we'll always be together." The life I'd fought for was safe again. My family was reunited. My daughter had a beautiful future stretching out endlessly in front of her.